I have got to admit that I revel in off-road driving, once covering over 300 miles off road, free from other traffic apart from the odd Park Ranger also driving an off-road machine, revelling in the challenge that seriously rough terrain can throw at me. I can also admit to being more than puzzled why such vehicles, particularly the largest, proliferate urban and city roads where their progress is more likely to be challenged by other oversized off-roaders rather than by wintery conditions in this era of so-called global warming. And why, oh why, do some owners of this type of vehicle fit them with low profile tyres that are hard put to gain traction uphill on grass, let alone on ice and snow? 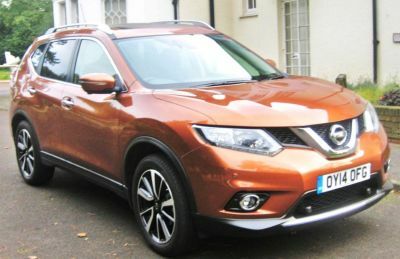 Thus, when the newly launched Nissan X-Trail came my way, I remembered commenting some years ago when testing the first X-Trail that it was sized about right and had the right credentials to deal with most rough stuff. There is a choice of two and four-wheel drive versions of the X-Trail and the former can be had with either a 6-speed manual gearbox or an automatic unit while the AWD machine is limited to just the manual unit. Well, if your really want to go on Safari or have a friendly Park Ranger that would let you loose on some challenging peaks than I recommend the AWD version which I managed to take out on some more than entertaining terrain a few weeks before I took over a two-wheel drive manual transmission version for full test. This is not a big machine as this category goes although it is offered in 5/7-seat versions and my off-road experience convinced me that in extreme conditions the AWD version is one of the most competent and comfortable riding all terrain cars I have encountered. The way that tractive effort automatically shifts from wheel to wheel as conditions dictate proved awesome. Amazingly, all X-Trails are powered by a 1.6-litre turbo diesel engine developing 130 ps or approximately 129 bhp accompanied by a great deal of flexibility - a size of engine that would be laughable for this type of application not so long ago! Switching to the two-wheel drive version convinced me that even shod with road-type tyres there was more than sufficient all-round performance to provide a high standard of driving and handling quality to deal effectively with a wide variety of driving challenges. Importantly, all X-Trail models employ a well developed fully independent suspension system that ensures excellent road holding and stability, allowing for seriously uneven road or off-road surfaces to be traversed both effectively and with a very high standard of ride comfort. 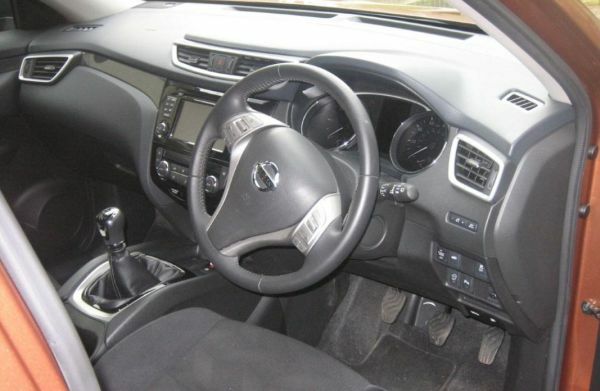 The driving ergonomics ensure that the driver feels part of the vehicle rather than simply perched in the driving seat and when this aspect is combined with light and positive steering (turning circle is about as tidy as an average family car) and complemented by a smoothly effective all-disc braking system then it is easy to accept that the X-Trail makes a lot of sense. Of course, there is that usual diesel rattle on cold start-up but that becomes quite subdued after a short while and it is obvious that this is an easy car to live with under all driving conditions, the six speed gearbox, though feeling a bit tight when shifting across the selector gate (should soften up when some miles are behind it) providing ideally spaced ratios suitable all driving applications. Performance is to a great degree what you make it - the official top speed is a quoted 117 mph with 62 mph (100 kph) reached in a commendable 10.2 seconds and the official combined fuel consumption figure is 57.6 mpg. Load it up, make it work, crawl up some steep inclines off road and I am certain users would report all sorts of variable returns but never near the 13 mpg I got all those years ago in a V8 petrol contender! Settle for around 40 mpg and a zero road tax the first year followed by £110 annual road tax and use the stop+start system to eliminate fuel waste/emissions in traffic congestion and it’s almost that proverbial free lunch! Visually I think it is a smart machine with flowing lines that do not sacrifice what is a generous interior with good load practicality, it is also modern styled inside with smart fascia presentation, easy on the eye instruments plus a lot of other useful information. The specification of this n-tec model it seriously competitive -you get forward emergency braking, lane departure warning, traffic signal recognition, intelligent key system, powered tail gate, powered folding mirrors, powered panoramic roof, satin roof rails, rear privacy glass, dual zone air conditioning, auto parking brake with hill-hold system, tyre pressure monitoring system, touch screen navigation, 6-speaker audio, the usual connectivity, alloy wheels (and a real spare wheel under the boot floor) and more. OK, so the upholstery is smart cloth rather than leather on this version but in summary one has to appreciate the Nissan X-Trail - strong on build quality and finish, immensely practical, a very easy driver even in crowded towns, a good cruising machine and even with two driven wheels pretty sure footed. A creditable vehicle in many respects. MAIN RIVALS: Land Rover Evoque, Audi Q5, Jeep Cherokee, Toyota RAV4. Price: From £27,295- as tested £27,845 Entry level Visia version from £22,995.